"From e-vehicle perspective, the government is playing the role of an observer"
With petroleum consumption on the rise, the need of the hour is the deployment of light electric vehicles (LEV) on Indian roads. 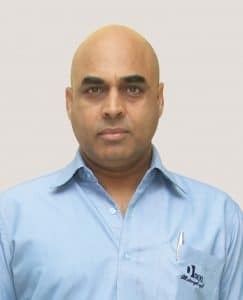 Vinod Sharma, MD of Deki Electronics Limited, in an exclusive interaction with Baishakhi Dutta of Electronics Bazaar, unveils the strategy behind the joint venture between IPEC Drive Systems and L7 of Finland, and how Indian players are all set to revolutionise electric vehicle power trains. EB: What is the most significant difference between the parallel/single-cell power trains and the traditional systems? Which of these offer more benefits? In a traditional power train system, while every cell may have a nominal voltage of 4V, the complete system requires around 48V. Each battery pack comes with a temperature sensor and a voltage sensor, which are connected to the battery management system (BMS), and then this circuit acts as the management system for the whole battery pack. Because of the electronic circuit setting in the BMS, some amount of voltage gets converted to current all the time, thus leading to thermal losses. Therefore the traditional power train system is not energy efficient. In the parallel system, we are connecting a single cell or a series of cells in parallel. This means, the delivered voltage of the battery pack is 3.65V, which is the normal voltage. The advantage of this advanced system is that users can raise the voltage of the engines according to their needs, starting from 3.65V, and this results in just nominal thermal losses. EB: What improvements in electric vehicles (EVs) will the new power train bring about? Superior vehicle range, enhanced performance and increased reliability while optimising overall costs. Due to no thermal losses, the BMS and motor controller are not required. It also checks the issue of cell balancing. The charger becomes much simpler. In the traditional system, the charger gets charged through the BMS. Monitoring the engine becomes much simpler since with the help of this system, we are putting everything on the cloud. The cloud connectivity capability of these drive systems can transform electric vehicles into connected vehicles. EB: Do tell us more about the functions of the ChargFlo software solution and how it fits into this kind of a system? The software acts as a complete operating system. It enables users to have an in-depth knowledge about the charger of an EV. It helps users know how much electricity can be consumed and for what duration of time. The billing amount with the local electricity authority is automatically controlled by the software. As an individual, if you are charging your electric car or scooter, you get an app on your phone through which you can avail various facilities like paying bills directly, charging the EV and more. It also creates a link between your vehicle’s battery and the charging unit, ensuring that the right amount of current and voltage are being passed down to the battery. On the other hand, if you are a fleet operator, you get information about the hundreds of chargers installed all over the country—their usage, billing amount, etc, thus ensuring a smooth monitoring system. EB: How do you see this software-assisted approach shaping the automotive industry, going forward? The software assisted system enables centralised monitoring. For a consumer with a good knowledge about the EV charger, the monitoring facility is very crucial. The software ensures that the EV and its charger operate smoothly. Like all connected vehicles, this software will show the state of the vehicle’s charge, which will help consumers by presenting a complete dashboard of parameters in front of them. EB: What will be the business and revenue structure of the JV between IPEC and L7? What is Deki’s role in this venture? At first, we created a company called IPEC Drive Systems Pvt Ltd, which is into power electronics. The company is primarily into making chargers (private and public charging pods for consumers). It manufactures, designs, tests and deploys charging systems for e-vehicles. Currently, we manufacture chargers for Ather Energy, and intend to do so for other vehicle manufacturers and charging stations too. Under IPEC, we are also driving the installation of the first EV charging station in Delhi, which should be done by December 2018. This JV is made up of three partners—Deki Electronics (Noida) which specialises in electronic components and has a strong design perspective, Meher Group (Bengaluru) which is a power and electrical company, and SungHo Electronics (South Korea) which is a public listed EMS company that’s into power supplies. The three of us have come on board with equal shares of the JV. IPEC as a company has entered into a 50-50 joint venture with L7 of Finland. IPEC is playing two roles in this JV—one as the investor and the other as the manufacturing partner. So the drive, which is the most complex system, will be manufactured at IPEC. Our team is already working on customising the L7 drive for customers in India with production expected to start shortly. Currently, we have a factory in Bengaluru, and within a year we envisage coming up with another factory in Noida for North Indian customers. EB: What made you choose the Indian market to launch the product? Three major factors are behind this decision. First, the drive is far more suited for two- and three-wheelers, or for small cars, because if you choose heavy vehicles, the current becomes very high. The components that are currently available in the market cannot handle that kind of current. Almost 73 per cent of the Indian transportation market comprises two- and three-wheelers. Second, India is trying to cut down its dependence on petroleum because of the high price, and at the same time, it wants to clean up the environment much quicker. We have seen the adverse effects of pollution and environmental damage. So, strategically, India is a good option, compared to many other countries. Third, since we are based in India, we wanted to flag off the journey from our home country; we plan to expand our reach globally. EB: What are the challenges in India for EVs, and which ones need to be addressed on priority? From the e-vehicle perspective, the government is playing the role of an observer and seems to have decided that it will leave things to the market forces to shape the EV industry. However, some positive steps taken by the government include waiving the distribution charges from EV chargers. Going forward, the government needs to create the necessary infrastructure and work on policy implementation. Existing policies should be enabled as well. For example, the e-commerce sector is undergoing a big boom currently. In this space, the government can come forward and help the EV industry by mandating that e-commerce deliveries are only made using EVs. This will lead to a rise in demand, which in turn, will help a lot of players find a ready market in the country. EB: Do you think there is sufficient clarity in the policy framework and regulations regarding EV charging stations in India? Not yet. The government is discussing standards and I hope some will be released soon, which will define the sockets both for AC and DC charging. That will make it a level playing field. These kind of technical and configuration standards still need to be worked out. EB: How do you see the Indian EV market evolving and when do you see EV four-wheelers becoming mainstream? From the volumes perspective, the first big EV sales will be led by two-wheelers in India, followed by three-wheelers. Then will come the four-wheeler fleets, like Ola, Uber and the electric buses (due to the huge push by the government). Privately held passenger vehicles will come last because of the challenges and high costs. The electrification of key corridors on highways is also something that needs attention since trucks and buses use up a lot of energy. There are challenges in terms of charging infrastructure also, when it comes to personal mobility, which need to be worked upon. So I believe we still have a long way to go in this segment.